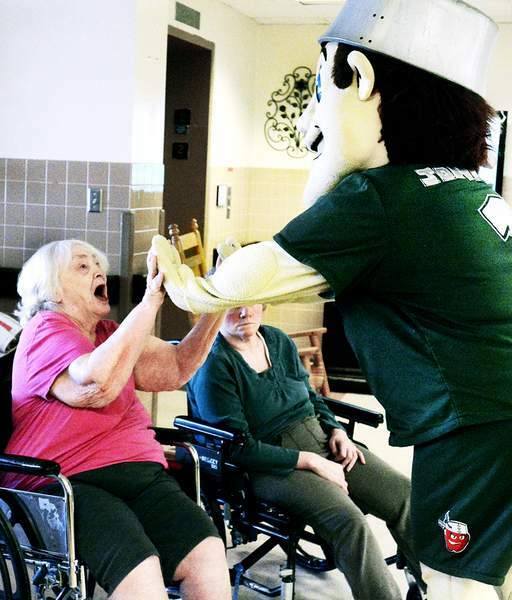 Cathie Rowand | The Journal Gazette Bessie Ruoff gives a double high-five to Johnny TinCap, who visited Byron Health Center on Tuesday. The TinCaps’ mascot has been making the rounds to promote the baseball season, which starts this week. The TinCaps’ home opener will be at 6 p.m. Saturday at Parkview Field.